Rendering of BAM South project’s public plaza and tower. Image Credit: Two Trees Management. Local Council Member Letitia James reaches agreements with developers and City to increase affordable housing, preserve nearby public library. 22 Lafayette LLC and the NYC Economic Development Corporation proposed to develop a cultural space and residential tower and plaza at 113 Flatbush Avenue in Brooklyn. The site for development is a triangular lot bounded by Flatbush and Lafayette Avenues and Ashland Place. The lot was previously the subject of a 2007 request for proposals that sought a developer to create an underground parking garage as part of the BAM Cultural District; those original plans evolved into the current proposal. The current use of the site includes a surface parking lot and a vacant one-story building. The lot is owned by the EDC and the City, and the development would be built, managed and operated by Two Trees Management in partnership with the City. The project, known as BAM South, calls for a 16,000 square-foot public plaza and a 382-foot, 32-story mixed-use tower with a below-grade parking garage. The mixed use building would include 28,400 sq.ft. of retail and restaurant space on the ground floor, 47,000 sq.ft. of cultural space on the second through fourth floors, and 273,000 sq.ft. of residential space on the fifth through thirty-second floors. The cultural uses would include a branch of the Brooklyn Public Library, BAM cinemas, and studio and rehearsal space for 651 Arts. The residential portion would include up to 402 units, 20 percent of which are planned to be affordable. The tower would occupy the north-eastern side of the triangle and was designed to preserve views of both the Brooklyn Academy of Music’s Howard Gilman Opera House and the Williamsburgh Savings Bank, which was designated an individual landmark in 1977. The actions requested in the application would extend an adjacent C6-2 zoning district to replace the current C6-1 zoning. The change would accommodate more residential floor area. The applicants also seek the creation of a new special permit that would allow for increased community facility floor area and modified street wall, height, setback, and signage regulations for buildings with cultural uses within the Special Downtown Brooklyn District. This action would facilitate the unique design of the building and provide more community space. At the City Planning Commission’s hearing on March 20, 2013, the two main areas of contention with the proposal targeted the design of the building, and the new library’s impact on the nearby NYPL Pacific branch. Local residents testified that the building’s design should be modified to preserve views from the Bank. Local organizations, including the Park Slope Civic Council, and neighboring District 33 Council Member Stephen Levin contended that a new branch would lead to the close of the nearby Pacific library branch. Speakers expressed concern that the new branch would be in a heavily trafficked area, making it difficult for young and elderly patrons of the Pacific branch to access the new library’s location. The proposal was approved without modification by City Planning on April 24, 2013. 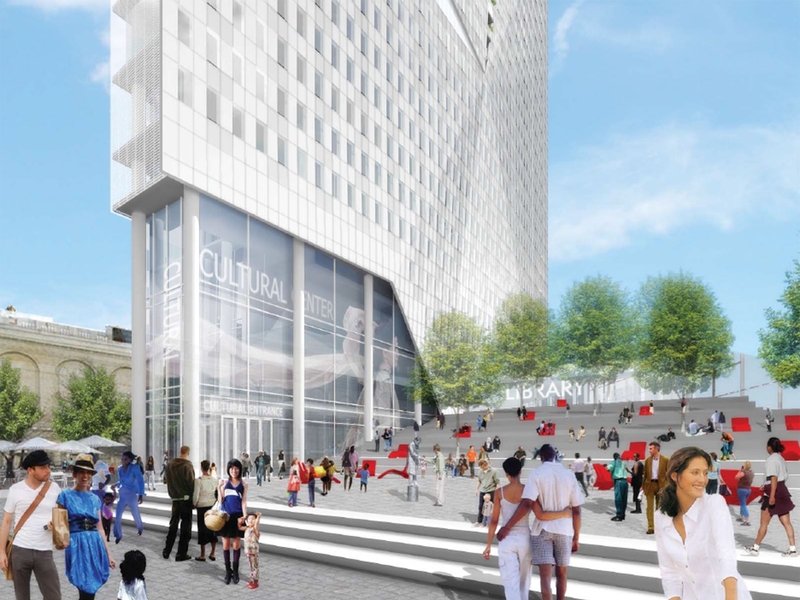 City Planning stated that the project would enhance Downtown Brooklyn’s cultural environment and provide needed housing in a transit-rich area. The tower’s design, massing, and location was deemed appropriate as proposed; the building’s transparency and varied heights and balconies would accommodate views of the Bank and Opera House, while providing light and air to the public plaza. City Planning noted that permission to site a new library at the lot was granted in 2004 and that NYPL’s plans for the Pacific branch were not within the scope of review for the current proposal. At City Council’s Subcommittee on Zoning & Franchises hearing on June 4, 2013, Chair Mark Weprin questioned Two Trees on its commitment to the community facility and cultural uses of the site. Two Trees testified that although the cultural uses like the new library branch are not part of the contract with the City, there was no other plan for that site other than the proposal presented to City Planning and the Council. Local Council Member Letitia James questioned the adequacy of the amount of affordable housing and urged Two Trees to commit to more. Council Member Levin reiterated his concerns over the fate of the NYPL Pacific branch. The Subcommittee voted to approve the proposal on June 17, 2013. The full City Council approved the proposal on June 17, 2013. Council: BAM South (C 130116 ZMK – rezoning); (N 130117 ZRK – text amendment); (N 130117 ZRK – special permit) (June 17, 2013).